The dice calculation test examines how deft you are with calculating small numbers. The monitor will display several dice of which only the front side can be seen. 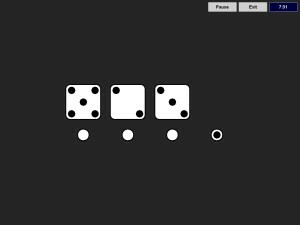 In each application your must first add in your head the visible dice front face and the back face of the dice. After that you must calculate the difference between the two sums.